Cancun beaches: not cool anymore? Tourists from all over the world mourn the loss of Cancun beaches, once unbelievably beautiful. Picture perfect, powdery sand descending into beautiful turquoise waters. The kind of beaches that make you drool over in travel brochures and magazines. If you've been here before you'll remember the sensation of the cool sand under your bare feet. 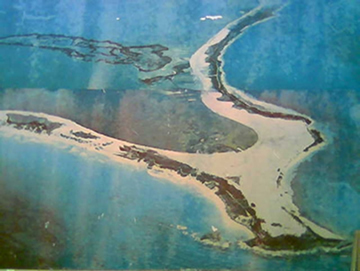 This is the original Cancun Island, a narrow 7-shaped sand dune. These talcon-powder-white beaches you see where the main reason the spot was chosen to develop a modern tourist powerhouse. I guess back in 1970 nobody cared about erosion, only about how fast they could build more and bigger hotels. Today Cancun is a major money machine generating a substantial part of Mexico's revenues. That makes the quality of beaches and their maintenance a big issue. and my guess is by overexploitation too. Most hurricanes go by relatively fast, say in 6 to 8 hours (not when you're actually in one, then time goes by reeeeal slow). Wilma on the contrary liked our beaches so much she decided to stay overnight. Two full days of force 4 hurricane winds did a good job of sweeping the Cancun beaches! Soon after, the authorities contracted a Belgium based firm, Jan de Nul, to repair the damage. In the course of 2006 thousands of cubic meters of sand were pumped up from nearby sandbanks. After work was finished some beaches had even doubled their original size. Everybody was happy and there was a big party to celebrate the re-opening of 12 km of restored coastline. However, tourists soon discovered the incredible out-of-a-movie beach was largely gone. The original Cancun beaches consisted of coral sand. Actually 'coral sand' is a confusing term. Most of it is made up of eroded limestone, which in turn consists of tons of compacted skeletal remains of tiny sea-creatures like certain algae and crustaceans. The new sand pumped from the bottom on the contrary is coarse. The grains are thicker than coral sand and not talcon-powder white. And unlike coral sand it doesn't feel cool on your bare feet. But hey, they were still great beaches. Until erosion kicked in again. Over the past year and a half almost all of the new beaches have been washed away. A recent example is Playa Ballenas, one of Cancun's popular beaches. After a day of fierce winds early March it turned out that overnight the beach had just...evaporated. Tourists and hotel employees were blown away...and so was the beach. I also remember seeing aerial pics taken after the restoration works. When the coarse sand started to wash away the clouds of sand floating in the ocean were clearly visible. These clouds created an additional problem. Because of it's higher density compared to coral sand the coarse started to suffocate the already delicate reef banks. Consequences are even visible on my favorite beach at nearby Isla Mujeres. A large part of it's North beach has dissapeared into the sea. Part of the problem comes from natural erosion, but it seems an important factor has been the fact that most of the sand used to fill up Cancun beaches came from sandbanks on Isla's shoreline. So now the island is sliding into the sea. And last but not least: if you think that we humans are the only ones affected by the erosion of beaches, think again. Cancun beaches have always been an important nesting area for sea-turtles. Without these beaches, they have nowhere to go. So they too will benefit from beach improvement and an equally important beach maintenance program. Logically, somebody will have to pay for that, too. My guess is that In the end it will probably be you, the visitor. Sea-turtles don't have money, you see. Does all this mean you should forget about Cancun and go to the Maledives instead? By all means, don't. You can still find more than one breathtaking beach and the water is as transparent as always. Some hotels have even gained beachfront because the sand gets washed away at some place and the current takes it to another. adjust your expectations about Cancun beaches before coming here. Otherwise Cancun is still the gateway to the Mayan world and is becoming more attractive for people who are not entirely focussed on the beach, like golfers. They worry about grass length and tee time, and less about sand.